In September, 1974, I became an associate in the law offices of Cohen, Stokke, Owen and Davis. Wallace Davis was one of the partners. Naturally, I immediately became active with Wally in bar and political activities. I asked him about the Latino lawyers in Orange County and if we had an organized group such as the Mexican American Bar Association (MABA) in Los Angeles. MABA was organized in 1957 and incorporated in 1960. Justice John Arguelles, who started practicing in 1950, was one of the charter members of MABA. Wally replied that we did not but that we should start one. He told me that some of the Latino lawyers had met informally over the years but that they had never decided to formally organize. The first Latino lawyer in the OC was Judge James Perez who began in 1956 and Wally was the second in 1965. We contacted Mike Silvas and Fred Munoz. They were interested. 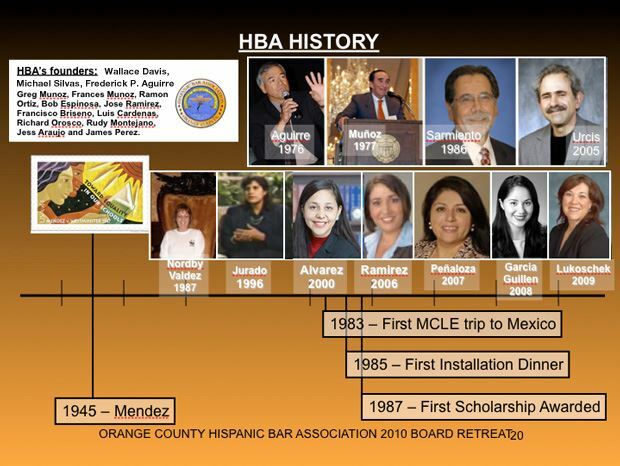 We all contacted the remaining Orange County Latino lawyers: Greg Munoz, Frances Munoz (PD), Ramon Ortiz (PD), Bob Espinosa, Jose Ramirez, Francisco Briseno (DA), Luis Cardenas (DA), Richard Orozco, Rudy Montejano, law student Jess Araujo and of course, Municipal Court Judge James Perez. 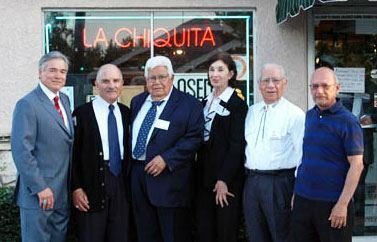 That month we all met for lunch at La Chiquita Mexican Restaurant, 906 E. Washington Blvd., Santa Ana, CA. The restaurant is located in the historic Logan barrio. We continued to meet monthly at La Chiquita because it had great Mexican food and because we could gather in the small, semi-private dining room. 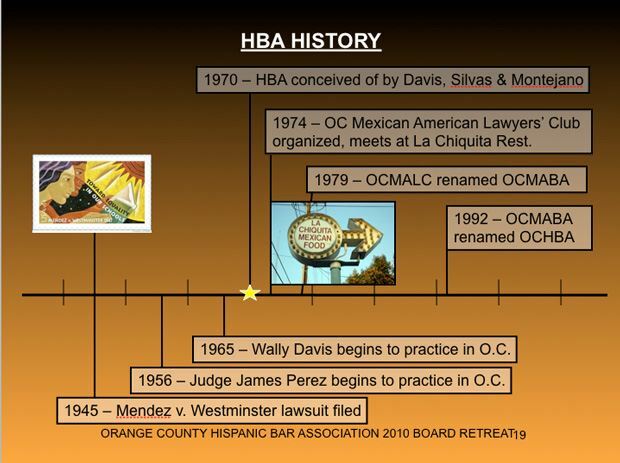 In early 1975, we decided to name ourselves the Mexican American Lawyers Club and we elected Mike Silvas as our first President. We did not incorporate the group at that time. We did not charge any dues. In fact, we did not even take any minutes of our meetings. We organized for three reasons: To socialize, to share information about our cases and to advocate for judicial appointments. In the history of the county, only one Latino judge had ever been appointed/elected Judge James Perez who was appointed to the North Municipal Court by Governor Pat Brown in December, 1965. Mike Silvas served the entire year of 1975 as President of our unincorporated group. That year Governor Jerry Brown elevated Judge Perez to the Superior Court. Judge Perez was Governor Brown's first judicial appointment in Orange County. In 1976, I was elected President. Luis Cardenas was appointed by Governor Brown to the West Municipal Court bench. In 1977, Greg Munoz was elected as President of our club. On March 10. 1977, Governor Brown appointed Francisco Briseno to the Central Municipal Court. In 1978, Wally Davis was elected President. On January 25, 1978 Governor Brown appointed Frances Munoz to the Harbor Municipal Court bench. She is the first Latina in the history of the United States to serve as a trial court judge. The first Latina in New York, Carmen B. Ciparik, was appointed by Mayor Ed Koch on May 30, 1978 and the first Latina to serve in New Mexico, Patricia Madrid, was elected in 1979. Other Latinas in Texas, Illinois and Arizona followed in the 1980s. In 1976, Richard Orozco was appointed by Governor Brown to the Central Municipal Court bench. In 1979, Jess Araujo became our club's next President. During his term Judge Briseno was elevated to the Superior Court. Joe Perez, Commissioner, July 20, 2007. Judges Firmat, Velasquez, Munoz and Rodriguez were elevated to the Superior Court in 1990, 1990, 1998 and 1998 respectively. Judge Ramirez was elevated to the Superior Court in 1986, then as Presiding Justice of the Fourth Appellate District in 1990. Wally Davis died in 1994, Mike Silvas in 2002, Fred Munoz in 2005, and Richard Orozco in 2018.